Choosing to have your pet’s teeth cleaned is one of the most important health decisions that you make.. Most animals do not receive daily teeth brushing which allows plaque to build up on the teeth. Plaque mineralizes and becomes calculus which can irritate the gums and cause gingivitis. Our professional teeth cleaning can take care of these problems. If left untreated these problems can lead to periodontitis which is an inflammation of the structures that support the teeth. As this disease progresses the gums are no longer able to protect the body from the bacteria in the mouth. These bacteria are then able to enter the animal’s blood stream and cause heart, liver, or kidney disease, in addition to tooth loss. Periodontitis and tooth fractures are very painful. Often we are not aware of our pet’s pain until these problems are repaired, and our pet becomes active and playful again. The frequency of cleanings is very individualized and depends on a several things (i.e. amount of preventative care such as teeth brushing or t/d diet, the species and breed of animal, and individual difference). Because of these differences we will check your pet’s teeth during each physical exam and let you know if they are in need of a cleaning, rather than prescribing a set period of time for every pet. Why does my pet need anesthesia for teeth cleaning? The teeth cleaning procedure involves an oral exam, manual scaling, ultrasonic cleaning and polishing of each tooth surface. It would be impossible to perform a thorough cleaning with your pet fully awake. Anesthesia keeps your pet safe, comfortable, stress and pain free during the procedure. We use modern drugs to help make anesthesia safe for your pet. We will assess your pet’s health and do any necessary pre-anesthetic bloodwork before any procedures are performed. With IV fluids and special monitoring equipment during the cleaning even older animals can safely undergo anesthesia. Our certified technicians monitor and assess your pet throughout the procedure. Allowing dental disease to progress unchecked puts your pet at greater risk for unnecessary heart and kidney disease. What can I do at home to keep my pet’s teeth healthy? You can greatly extend the time between cleanings with diligent home care. 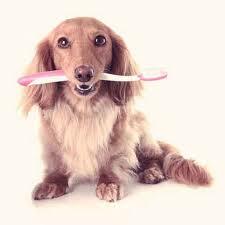 We recommend brushing your pet’s teeth at least two to three times each week. This will help to prevent plaque build-up and gingivitis and will allow for fewer cleanings. If brushing is not an option you may want to consider putting your pet on a special tartar control diet. The Hill’s company now makes a food called t/d that is designed to help keep your pet’s teeth clean. This is a highly specialized diet and is available only through veterinarians. We recommend feeding it to your pet as at least 1/4 of the diet. With severe periodontitis the support structures of the tooth are lost allowing bacteria to attack the tooth roots and surrounding bone of the jaw. This can also happen in teeth which have been fractured with trauma or by chewing on hard bones, rocks, etc. Cats are prone to a special type of cavity which is not treatable by filling because the tooth is eroding from the inside out. For all of these diseased teeth, the only way to remove the pain, restore the health of the mouth (and of the whole body) is to have them extracted. When we examine your pet we can often get a sense of whether extractions will be needed. However, it is only when your pet is anesthetized and the calculus is cleaned from the teeth that we can do a full oral exam to determine what extractions are required. We will provide you with an estimate for possible extractions and make every attempt to call you during the procedure if we feel it is necessary to exceed this estimate. Like you, our greatest concern is the well-being of your pet. Before putting your pet under anesthesia, we will perform a full physical examination. Secondly, your pet is evaluated, and tested for any organ abnormalities that we may be able to detect in the blood, such as, dehydration, diabetes, kidney or liver disease which could complicate the procedure. By doing a pre-anesthetic blood screen we are able to adjust the anesthetic regimen, if necessary (the best and safest - not the least expensive, anesthetic combination for your individual pet is chosen). These tests are similar to those your own physician would run were you to undergo anesthesia. In addition, the results of these tests may be useful later to develop faster, more accurate diagnosis and treatments in the event that your pet’s health changes. An IV catheter is then placed so we can maintain blood pressure, hydration, and organ function while your pet is anesthetized. It is very important for older animals, longer procedures, and any animal with compromised kidney or liver function. For some pets with extensive dental disease or who are older than 10 years this is critical to protect the kidneys. Every procedure we perform uses inhalation (gas) anesthesia so that your pet has a rapid and safe recovery. Specialized monitoring equipment such as ECG and doppler blood pressure are used to provide us with up to the second information on your pet’s cardiac performance. A certified technician continuously monitors your pet while anesthetized. Our dental prophy includes hand scaling of the teeth, ultrasonic scaling, full oral exam including x-rays, polishing and fluoride treatment. We use a combination of local anesthesia and injectable medication when extractions are needed to control pain while hospitalized. The entire procedure is performed by the veterinarian and licensed technician only. We do everything we can to ensure that your pet’s experience is non-traumatic and pain free. We are very proud of the care we provide and the level of safety and comfort we offer our patients. Pain relief in animals is very often ignored because they cannot talk to us. Some symptoms of pain are decreased appetite and activity following teeth cleaning. Some procedures with extensive periodontal disease or tooth extractions cause more discomfort than others. We are now able to prescribe very safe and effective medications to make your pet more comfortable in the days following teeth cleaning. We will prescribe pain medication if your pet needs extractions or has extensive periodontitis. If you are wondering where your pet needs a dental cleaning, please call our office at 608-241-1000; We would be happy to schedule an appointment.